1959’s Secret of the Lost Race is a fascinating little oddity; it has what must be the most bleak passage I’ve encountered in a Norton novel, the first (possible but not confirmed) matriarchy I remember encountering in her fiction (despite not having any on-stage women to speak of, which is an odd combination), and, because the copy I happened to find was the 1969 Ace reprint, a very interesting essay by Lin Carter. Marks ten years since the world has been without Andre Norton. We have a special gift to share with all of Andre’s fans. Orphaned when his mother succumbed to one of the many diseases that afflict a degenerate, crime-ridden Earth, Joktar was taken in by Kern, one of N’Yok’s many colourful crime lords. Kern was motivated less by a kind heart and more by curiosity about the mysterious dead woman and her child. Fifteen years later Joktar still looks like a kid and he still works for Kern, at least for another paragraph or so. Although Joktar has no reason to think he is particularly significant, his existence is an affront to certain highly placed functionaries. He has been safe for so long because his enemies had no idea where Joktar was or even if he was still alive—until now. Having stumbled over his location, Joktar’s enemies orchestrate a sweep of N’Yok. The ostensible purpose is to gather up gutter-sweepings to send out to the stars; the real purpose is to detain Joktar. Alas for the bad guys, they fail to take into account the poor discipline and essential corruption of the E-guards in N’Yok. Joktar is beaten up while in custody and the guards try to cover up their crime by shipping him out in cold sleep. His destination is the distant world Fenris. Even if the boy survives the trip (and many do not), no one ever returns from Fenris. Fenris is a hostile world but in accordance with the human ability to take bad situations and make them worse, Fenris is also dominated by a mining company that has very carefully driven away all alternate trade, giving the company total control over interstellar trade and total control over those parts of the planet that matter to them. Transportees face lives of hard labor and brutality. This is the same rotten deal that conscripts sent to Australia once faced, with added benefits of an icebox climate, maliciously active geology, and a wealth of hungry predators. Joktar survives the trip to Fenris. He survives a series of encounters with the various hazards of Fenris, which range from landslides to carnivores to bush bandits. He eventually becomes involved in what would be, in any other book, the A-Plot: the struggle by the free men of Fenris to win free of the company’s control. The plan relies on allies of dubious reliability and a space-ship hijacking that seems doomed before it begins. Even if the early stages of the plan work, there is no guarantee that humanity’s government will listen to the pleas of rabble over the demands of vips and plutocrats. This isn’t a typical SF novel and the struggle to free Fenris turns out to be secondary to the main plot: will those hunting Joktar will manage to catch up with him and what will happen if they do? Joktar embodies a secret that could determine the future of humanity, a secret his xenophobic enemies are more than willing to kill to conceal. 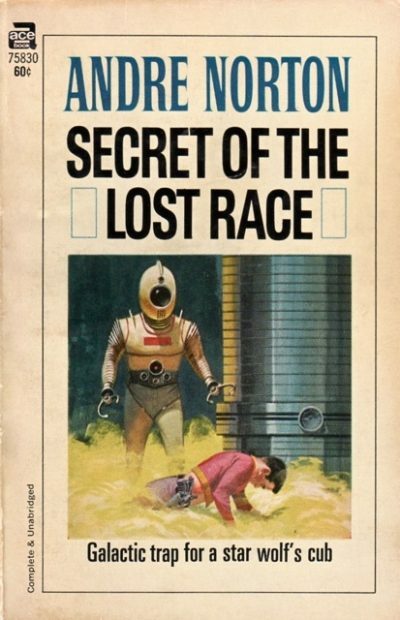 I am not sure that Secret of the Lost Race  is actually a novel rather than a novella; the paperback is only 144 pages long. Granted, the print in this version is tiny, presumably to cram as many words as possible into the diminutive package. The lack of space means that to keep the plot racing along Norton has to abandon certain luxuries, such as depth of character and any sense of shame about outrageous coincidences. As it turns out, the fellow speaking has been denied some important information, so things may not be quite as bleak as he paints them. Still, given how the novel ends, it’s possible that they are. We see an opportunity presented but not what follows. Although Norton does not go into details (because, hello, 144 pages), her off-stage aliens, superior to humans technologically and culturally, are all women. The only time they produce males is if they mate outside their species ; the main reason they’re still around is because they live for a very long time as humans measure it. It follows that the people calling the shots in the alien civilization have to be women because those are the only sort of aliens there are! Of course, this would be more impressive if the aliens ever appeared in the narrative instead of hovering just off stage. An entirely unexpected bonus in the copy I purchased was the inclusion of Lin Carter’s afterword, “Andre Norton: a Profile,” a PDF of which may be found here. Although I find Carter’s occasional descent into folksy phrasing a bit grating, I certainly cannot fault his enthusiasm or his grasp of her strengths. Or his determination, in spite of his space limitations, to pen a decent concise history of Norton’s career as of 1966. I’d love to know who those writers were.Carter ends by speculating about the future of Norton’s career and of the field; he’s not exactly right but at least he is entertaining. Secret of the Lost Race may be purchased in omnibus for from Baen Books. 1: I am guessing that we have good Donald Wollheim (the editor of whom it was once said he would rename the Old and New Testaments to War God of Israel and The Thing with Three Souls to better appeal to readers) to blame for that unpromising title. I honestly don’t recall if he kept that quirk when he left Ace to form DAW Books, although he did retain practices like concealing the gender of female authors behind initials like C.J. and B.W. 2: Yeah, it’s not a good idea to read SF for insights into biology. Let’s assume for the purposes of story that the Others are somehow related to all the other humanoid races. Publishers, however, and juvenile publishers in particular, tend to shy away from series. They think libraries don’t like “series” yarns”. An interesting look at a bygone era if true, but I do wonder why, if it was true, did all the school libraries. when I was a kid, have shelves of Hardy Boy, Nancy Drew, and other series?